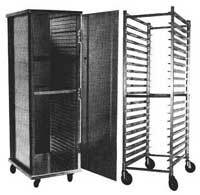 ﻿ Warehouse Storage Racks | Storeroom Storage Racks | Refrigerator Storage Racks | E System Sales, Inc.
E System Sales, Inc is a major provider and distributor of all types of Storage Racks for a warehouse, any store, a storeroom, or an industrial refrigerated system. Warehouse Storage Racks are configured from Madix Pallet Rack components in a Regular Duty and a Heavy Duty configuration with heights as high as 144 inches and depths of 48 inches. 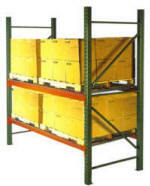 Are a type of lighter duty Pallet Rack racking system for storing or merchandising lighter duty supplies or merchandise where a Fork Lift is not necessary. 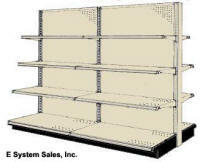 Gondola Shelving is the most popular store fixture that is in every Grocery Store all across the nation with many accessories to store or merchandise supplies or merchandise from clothing to wire. Storeroom Storage Racks for use of storing lighter weight merchandise or supplies for an office, store, or warehouse with storage needs. Refrigerator Storage Racks configured with Madix Wide Span Racks for storage for bulk or heavier refrigerated merchandise or supplies. Available in a Regular duty for most refrigerator applications and a heavy duty configuration with sealed wood decks or a wire deck configuration. We have to racks available for automotive batteries. Both are available as a starter sections and an add on section. 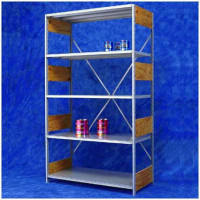 Made out of the components of Gondola Shelving in the double sided configuration. Can be configures into any custom configuration.